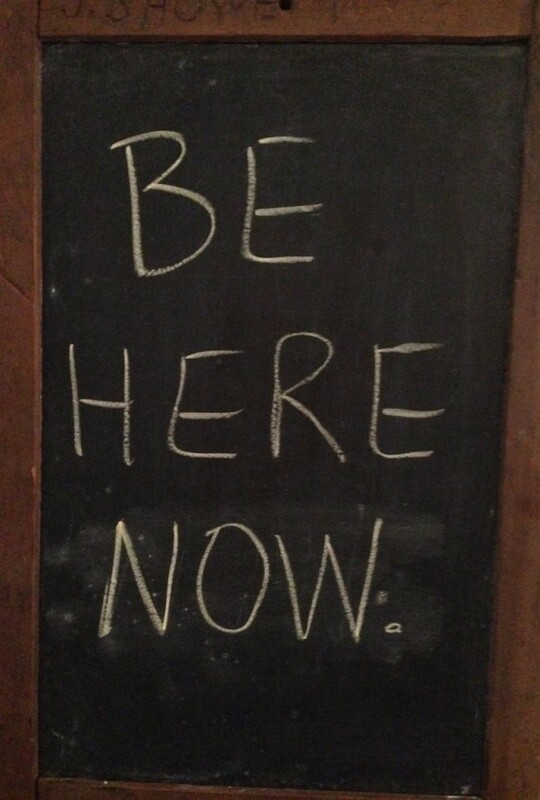 Browse: Home » 2014 » February » Monday mantra: Be here now. The class is hard. I haven’t escaped one without rubbery quads or trembling triceps. But it makes me feel strong and balanced and flexible. As I talked in a previous post, the best part of the class is what it does for my brain. The teacher opens each class asking us to think of an “intention,” which we revisit throughout the class. 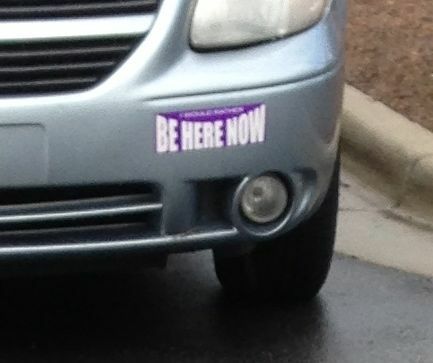 Even though that phrase has hippy-dippy/acid-trippy connotations for me, adding the “now” gave it a sense of urgency. A pre-21st century way of saying “Put down the damn iPhone,” among other things. I put it on our kitchen chalkboard. This morning, I dropped Noah and Rory off at preschool for the first time in a week. I gleefully went to yoga, excited for a whole 2.75 hours to myself. When the teacher asked us to think of our intention, I went to “be here now.” But it was not happening for me. Instead of focusing on my breath in a seated forward fold, I examined the stubble on my calves and wondered about the cankle-reduction surgery I recently read about and made a mental note that it was time to break the spending freeze with an industrial-grade pedicure. It was still a good class, but I was frustrated with my inability to calm my brain and focus on my intention. I went to Target for a few groceries (including a delicious glazed donut that I ate in the car) and then went to pick up Rory at school (and later realized that I talked to both of Rory’s teachers and a few other parents with frosting on my face). I arrived at Rory’s school a little early. I sat in my parked my car, squeezing every minute out of that 2.75 hours that I could. But not how I normally would. Not perusing Facebook. Not telling the world in 140 characters about the donut I just ate. 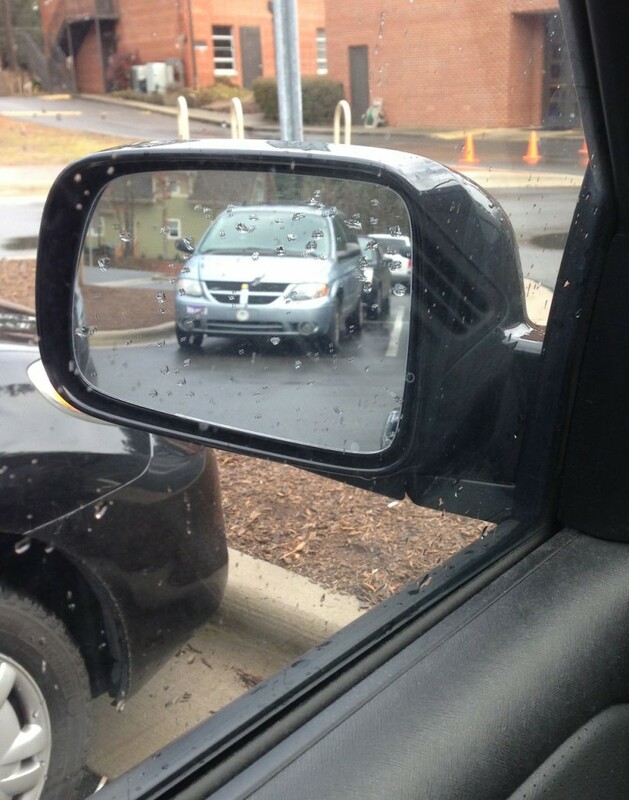 Gazing into my side view mirror, I noticed a bumper sticker on the front of the van parked behind me. Resolutions aren’t meant to be easy. What would be the point if they were? Mantras are aspirational. It would be useless to choose as an intention something I’ve already mastered. And even if I never master any of it, I appreciate the signs from the universe to keep trying. I see that bumper sticker every day and wonder whose it is. Depending on my mood, I am angry at that bumper sticker. Other times I think it is lovely. Glad it was a sign of encouragement for you today. Yes, I might have a very different feeling about that bumper sticker if, say, I saw it in my rearview mirror tailgating me. Which Y do you go to? Tell me more about this magical yoga class. I usually hate YMCA yoga, but this one sounds good. Jenny, I usually go to Lakewood. The teacher, Jeannie, teaches there on M, W, and Sat mornings, and at Hope Valley on Tuesday nights. Are you yogi-ing all the way through pregnancy? If so, I’m usually there Saturday mornings and would love to see you. Just get there early – the class is always packed.